“Hocus Pocus” will be running amok in an AMC theater near you. 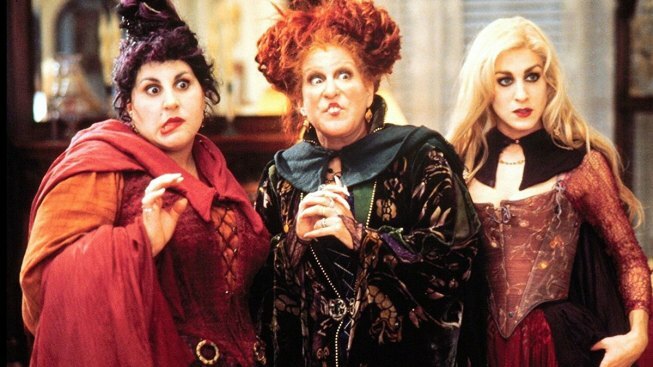 The 1993 Disney Halloween classic, starring Bette Midler, Kathy Najimy and Sarah Jessica Parker, will play in participating theaters from Oct. 26 to Oct. 31 in celebration of the film's 25th anniversary. The theater chain announced the news on Twitter Oct. 1 to the delight of its fans. The film will be on the big screen in AMC theaters in every state and Washington D.C., except Alaska, Hawaii, Maine, Mississippi, New Hampshire, Rhode Island and Vermont. “Hocus Pocus” follows the Sanderson sisters (Midler, Najimy and Parker), three witches presumably hung during the Salem Witch Trials, after a teenage boy and his friends in modern-day Salem, Massachusetts accidentally resurrect them on Halloween. The awakened sisters go on a rampage through the town as the kids try to stop them from stealing the youth from all the children they see. The film is PG-13, so Midler’s charming rendition of “I Put a Spell on You” can bewitch the whole family.